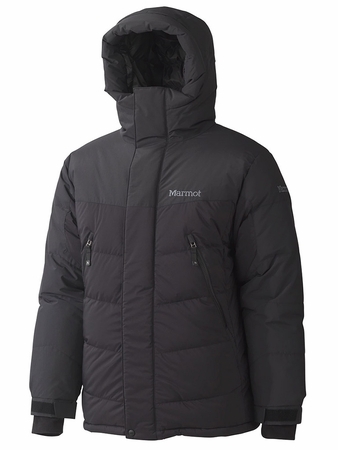 Marmot Membrain™ lamination utilizes advance technology that balances the best in performance of breathability, waterproofness, and water repellency with excellent durability. With a minimum of 10, 000mm / 10,000mm performance it's guaranteed to keep you dry and comfortable in the worst of weather. How does it work? Marmot Membrain™ technology offers excellent weather protection with interior comfort. The hydrophilic nature of the PU lamination reduces internal condensation and increases comfort range by reducing the chilling effect caused by converting condensation build up back into vapor. What are the benefits of this technology? Waterproofness: 10,000 mm minimum JIS-L 1092 Breathability: 10,000 gm / 24h minimum JIGS-1099 B1 Hohenstein RET: 6 to 8 Technology: 2 layer Hydrophilic PU Lamination Down Defender What is it ? We've currently used Down Defender in our Snowsports, Urban Exploration and Kids collections. How does it work ? The treatment coats the individual plumes of the down cluster with a DWR (durable water repellent) at the molecular level. It puts a hydrophobic layer on each individual plume of the cluster. This treatment is done during the down cleaning process. The finish is extremely durable allowing the down to maintain its water repellency over 20 washes. The treatment also enhances the down's integrity and the durability of the cluster helping to increase its longevity. What are the benefits of this technology?